in the Bihar PHED, Water Resources Department, Bihar Animal and Fisheries Resources and Road Construction Department. There are total 70 AE Jobs in Bihar Animal and Fisheries Resources. Out 70 vacancies 64 posts of Assistant Civil Engineer and 06 posts for Assistant Mechanical Engineer available in this BPSC AE Recruitment 2018. Selection this BPSC AE jobs Recruitment will be through GATE (2016, 2017, 2018) Score only. written exam and interview. To apply for this BPSC Assistant Engineer vacancy candidates must have completed a Bachelors degree in B.E/B.Tech in the streams of Civil or Mechanical. BPSC Assistant Engineer (civil), Asst Engineer Mechanical Jobs vacancies application form will be accepted through BPSC website @http://fts.bih.nic.in/PHEDRECAEGate/Register.aspx. Last date for the recruitment of BPSC Assistant Engineer (Civil, Electrical) is 15-12-2018. Online application started on 26-11-2018 for this BPSC AE Jobs Recruitment 2019. Educational Qualifications, Selection Process, fee particular and more information about Assistant Engineer jobs of BPSC AE Recruitment 2019 are given below. Click here to see the official notice of BIHAR PSC Assistant Engineer Civil, Mechanical Jobs Recruitment. Current notification for BPSC for the vacancies available various departments of BCD Building Constructions Department, Road Construction Department RCD, RWD Rural Works Department, WRD Water Resources Department and Public Health Engineering Department PHED, Animal and Fisheries Resources Department. For department wise BPSC AE Jobs details are given below. At a time BPSC is recruiting candidates for the above said department. Department Names available vacancies details are given below. The candidate must have qualified B.E or B.Tech in Civil or Mechanical Engineering from a recognized university. For AE Mechanical, AE Civil Jobs lower age limit as on 01-08-2018 is 21 years and upper age limit is 37 years for this BPSC BCD,WRD, SWRD, RWD, RCD and PHED Departments. For General Female and BC/OBC candidates upper age limit is 40 years. For SC/ST candidates upper age limit is 42 years.Age limits for Animal and Fisheries Resources Department as on minimum 21 years as on 01-08-2016 and maximum 37 years as on 01-01-2011. Candidates selection is based on GATE 2016, 2017, 2018 scores. Eligible candidates can submit their application form online using official website bpsc.bih.nic.in. Pay the fee in SBI. After successful application submission online download the exam syllabus and start preparation. 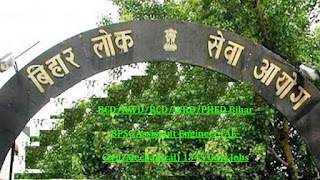 Click here to apply online for the BIHAR PSC Assistant Engineer (Civil/Mechanical) Vacancy Recruitment 2019. Please share this BIHAR PSC Assistant Engineer AE Civil Recruitment 2019 article with your friends. Selection for this BPSC Assistant Engineer (Civil/Mechanical) Jobs recruitment will be held based on Preliminary Exam and Mains Examination. If less applications received then prelims exam will not be conducted for BPSC AE Jobs recruitment. BPSC will conduct mains examination which is having 6 different papers. Total recruitment will be conducted for 1000 marks. Written test will be in conducted for 900 marks and having 6 different papers. For General/BC/MBC/SEBC candidates BPSC AE Jobs exam fee is Rs. 750/- and bank charges Rs.50/- for SC/ST candidates BPSC AE Jobs examination fee is Rs.200/- and Bank charges Rs.50/-. Candidates have to pay this amount in SBI bank using system generated chalan. Account number to deposit the cash is 31650243410 SBI bank. And keep receipt in a safe custody. In future whenever asked by BPSC you have to submit the same.